With six hour travel times a thing of the past for Steven Taylor playing three matches in a week is no longer a problem for the experienced centre-half. Taylor endured lengthy journeys while playing in the MLS with Portland Timbers, but with those days now over he is desperate to get on the pitch again on Tuesday night and put right what he calls a “blip” for Peterborough United. Posh lost 3-1 at the ABAX Stadium on Saturday (September 9) thanks to first-half goals from Bradford’s Dominic Poleon, Romain Vincelot and Matthew Kilgallon, with Jack Baldwin pulling a goal back after the break. Two of the goals came from set-pieces which frustrated Taylor who now wants to see a response in the derby game against MK Dons. The summer signing has not featured in the two Tuesday night cup matches so far this season but he says he’s fit and ready to go if called upon by boss Grant McCann. “I did three games a week in America with six hours travel. Now I don’t have that six hours travel I’m ready to go. Tuesday can’t come quick enough and I just want to get out there again,” said the former Newcastle United man. “We’ve had a defeat, it’s going to hurt. But we have Tuesday night and it can’t come quick enough. “The lads are disappointed in there. You come in, you’ve been beaten 3-1, it’s not good enough. We all know that. 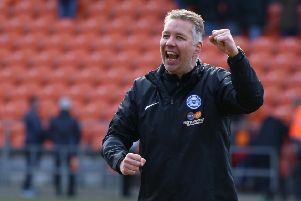 Taylor acknowledged that defeat to Bradford, which saw Posh lose their place at the top of the league, came from the first-half performance. He said: “It was a poor first-half, that’s when the game was dead and buried. I think the first five minutes they were trying to kill the momentum, the ball was going out of play in our half, we just couldn’t seem to get out and play through them. “They were very compact and very tight. Things weren’t going for us. “Second-half it was a much better team performance and that’s how we should be playing, getting them on the back foot. “We had chances and we didn’t take them and they did. But like all season we’ve won games and put them to bed and moved onto the next game. This is what we’re going to do. “We’ve been very good in wide areas stopping crosses, defending the box no problem at all. “We’re going to have to review this and put it right because I think when the ball is put in the box, like we have done all season, we just need to attack it. “The only chances they’ve had they’ve scored. After that we were very comfortable at the back, and going forward they looked very nervous, especially down the sides. “There were a lot of arguments from their players on who was picking up who. I thought we could get back in the game. “We’ve had a good start to the season. This is a blip, but we just want to concentrate now on MK Dons.